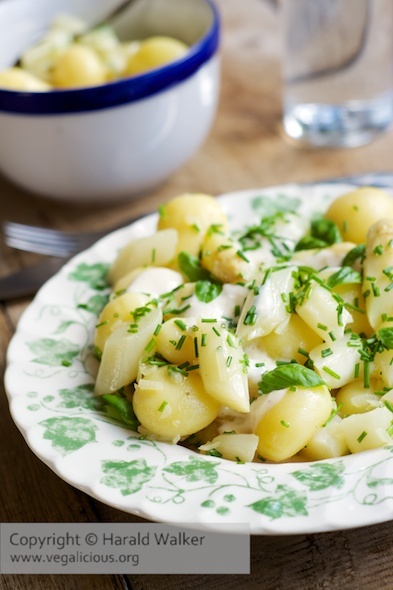 Asparagus and Potatoes are a favorite and very tasty combination. This is a sweet salty type potato salad. It’s easy to make and tastes great no matter which asparagus you use. Cook the potatoes al dente. Allow them to cool, then peel and cut into bite sized chunks. Put the potato pieces in a large bowl. If using white asparagus, cut off the thick woody end, and peel using a vegetable peeler. If you have green asparagus, all you need to do is wash and cut off the woody end. Slice the asparagus in 1 – 1½ inch pieces. Place the asparagus pieces in the water to cook. Cook the asparagus al dente. Check for “doneness” by piercing with a fork. When the asparagus are done, remove from the water and plunge into a bowl of icy water to stop the cooking process. Chop the onion and place in a small saucepan. Add the vegetable bouillon and bring to a boil. Cook until the onion is soft – just a few minutes. Add the vinegar, sugar and mustard to the onion bouillon, thus making a vinaigrette sauce. Pour the sauce over the potatoes and asparagus and gently mix. Allow the salad to marinate for at least ½ hour. Shortly before serving, chop the herbs and add to the salad. Serve the salad in a large serving bowl. Garnish with dollops of soft vegan cheese and a few more herbs sprinkled on top. 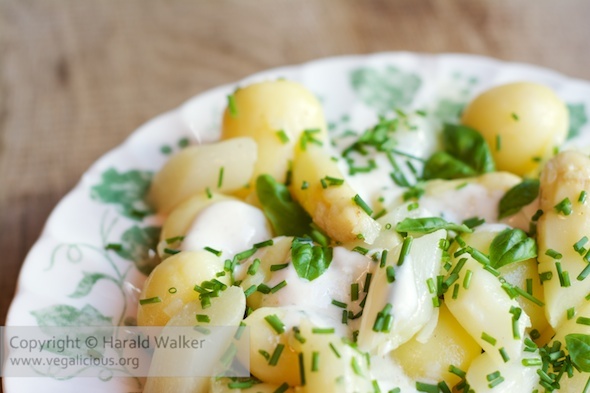 Posted by harald on June 3, 2014 in Asparagus, Potato, Salads.